After having breakfast at the hotel, we quickly checked out and headed to Universita dei Sapori, where we learned how to make pizza and stuffed pasta. Chefs Mateo and Gabriel were our guides to make pizza in the traditional fashion. We worked with the dough to form it into the proper size/ball, and then put that away to let it rest. Additional dough was made available to us to practice our stretching skills. I’ve been making my pizza crusts all wrong for years. We each got to make a pizza including putting it in and taking it out of the oven. Our pizzas were to be served with our lunch later in the day. Chef Gabriel then made a traditional Napoli pizza which is where he is originally from in Italy. The dough is different, the style of making the pizza is different, and it’s baked in a much hotter oven. While we didn’t have the traditional wood oven of Naples, it came close. From pizza making on to preparing our lunch of fresh tortellini finished with sauteed mini squid and accompanied with a garbanzo bean soup. 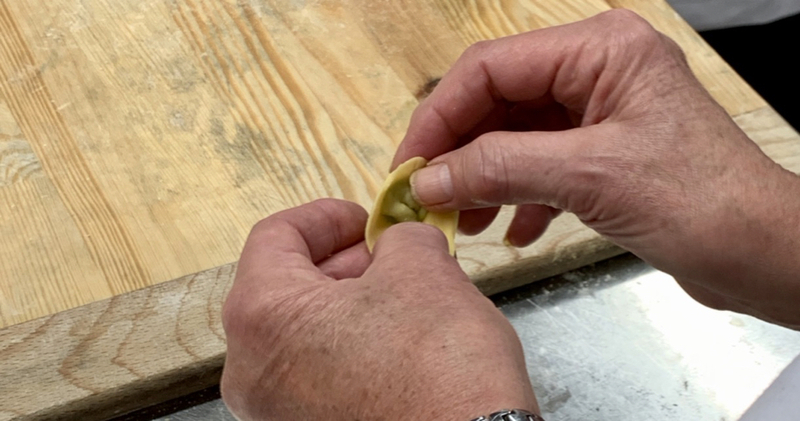 We each took turns rolling out the pasta dough, filling and folding to make the tortelloni. The soup was fairly traditional in flavors and construction. The pizza, soup and tortellini were served as our lunch with wine, of course. We’re learning that wine is with almost every meal here in Tuscany. They also served two tart like desserts which left us sufficiently stuffed. After lunch came one of the best sessions of the day. We met a gentleman who affectionately has become known as the cheese whisperer. He had us sample six different cheeses, including a 40 month aged parmigiano reggiano. As we sampled each cheese, sometimes a third or fourth time, it was amazing to taste the way the flavors changed and evolved on the mouth. After capping of the lesson for the day with the cheeses, we boarded the bus and drove through Tuscany to the Chianti Classico region where we are staying at the Riserva di Fizzano for additional culinary lessons. Dinner was served by the resident Chef Aldo who prepared several dishes all including or enhanced by the local ingredients. Dinner was of course served with red wine from the local vineyard. We also had the opportunity to try the extremely local olive oil which was simply out of this world.